Earthquake Blanc. Daffy Duck, Porky Pig, Yosemite Same, the Road Runner and four other Warner Brothers characters were recruited by the California Office of Emergency Services in 1977 for a series of radio public service messages on earthquake safety. 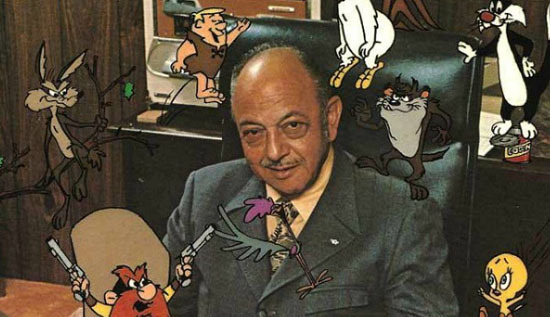 The state paid $8,200 to produce ten different messages featuring the vocal talents of Mel Blanc. The radio messages stressed survival information such as the need to know basic first aid, safety precautions in skyscrapers and similar preparedness suggestions. 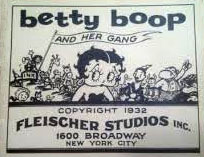 While the messages were delivered in a humorous vein, safety information received the top priority, even at the epxnese of some of the character’s popular catch phrases. Bugs Bunny never got to say “What’s Up, Doc?” and a “Sufferin’ Succotash!” from Sylvester the Cat was cut in favor of more safety information. Television spots were also prepared but used a mime instead of Warner characters. Whangdoodles. In 1978, Producer Blake Edwards and the husband of actress Julie Andrews was in discussions with DePatie-Freleng to produce an animated/live-action feature film based on Andrews’ children novel “The Last of the Really Great Whangdoodles” (1974). The film was never made. Bruno Bozetto. “I’m not really sure a feature is the best vehicle for animation, because animation is usually very strong when the film is short. Features are like putting water into wine. The short film is a fantastic medium because you can work alone. You have no problems. You can do what you want. But you can’t reach an audience in America. It’s very difficult to distribute a short film here. I think audiences are ready to see a new kind of animation: more adult, more modern, but the feature is the only way to reach them. 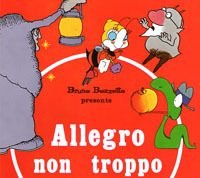 Allegro Non Troppo (1976), for example, is a feature and is not a feature. I put several shorts together, which I think is a good way to make a film. The live action sequences were intended to provide a strong change of mood. If you see the film without those sequences, the animation doesn’t seem as interesting, because the contrast between those dark, black and white sections and bright, animated ones is missing. My favorite sequence in ‘Allegro’? ‘The Valse Triste’ because it is based on a true story,” shared animator Bruno Bozetto to a reporter in 1976 when the film was released. Fables of the Green Forest. In 1976, it was reported that comedian Jonathan Winters would be doing a new series of animated children’s stories entitled “Fables of the Green Forest”. He was scheduled to do all the voices of the characters based on Thorton W. Burgess’ children stories like Minnie the Fieldmouse and Reddy Foxx. Captain Goodvibes! In 1977, Voyager Films of Australia announced the preparation of a cartoon short on the antics of the popular Captain Goodvibes, a pig-like creature who appeared in a surfing magazine, “Tracks” from 1973-1981. Captain Goodvibes was an icon in Australian surfing culture. “If the Pig of Stell makes it with this one, there may be a whole series of Goodvibes cartoons,” stated David Elfick of Voyager. The film was never made. Captain Goodvibes did have a cinematic cameo in the 1973 surfing documentary, “Crystal Voyager”, appearing in a brief animated sequence during the film. Clampett Exhibit. In 1978, the Cinematheque Francaise in Paris established what was to be a “special permanent display exhibiting the work of animator Bob Clampett from his earliest Warner Brothers’ work to drawings from ‘Beany and Cecil’” and I have absolutely no idea whether it is still there or like other “permanent” displays disappeared over the decades. Valse Triste has got to be one of the most harrowing, but beautiful shorts I have ever seen. It’s such a great illusion to loneliness and the persistence of memory. The world may never know, though we can always ask.